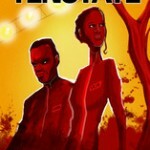 Last year Len Peralta and I put out five issues of a comic called TenState. It was about what happened when ten reality show contestants, from different political and religious backgrounds, were shut inside a biodome for the finals of their show and suddenly, disaster strikes. The stakes of learning to cooperate went from making good TV to survival. We used Kickstarter to fund those first issues and now they’re available in print and as digital editions from Comixology. Since then, we’ve all come to know Patreon as a way to fund creative endeavors. 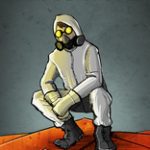 Patreon is perfect for something like episodic comics. You can pledge per issue and you’ll get the issue. Simple. We don’t put out an issue, it doesn’t cost you money. I cannot wait to tell more of this story. We’ve lined out four “seasons” of content and the layers will just keep peeling away. But we need enough people to pledge per issue in order to get started. So if you’re interested in seeing new issues of TenState, head over to patreon.com/lenperalta. That took awhile, BUT we have our TenState Comics issues 1-5 in a single volume available for pre-order over at Len Peralta’s store. 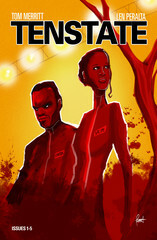 TenState is a comic series illustrated by Len and written by me. It’s about a group of people from different walks of life in the US getting thrown together in a biodome as an experiment that is also a TV show. As the lights dim for the first episode in the dome, something unexpected happens. And the divisive crew must try to work together to survive, for real this time. Len has two versions up for pre-order, one with his awesome cover and the other with an alternate cover which is also awesome, and drawn by the incomparable Scott Johnson. Stop that. I know you’re trying to compare him to something but I said he’s incomparable and I meant it. Now go read a book. Preferably TenState. TenState is a comic book series about a fictional TV reality show called “The Ten” that goes terribly wrong. It will be told in ten separate 10 page black and white installments. 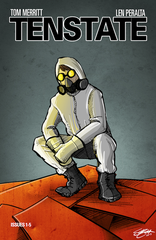 We are asking for money to fund the first three issues of the series. If we make the initial goal, we will add stretch goals for five issues and finally, the whole 10 issue season. Len and I have sketched out a basic story arc for season one, but we have ideas for at least four seasons. We are treating this comic as an episodic television series in the vein of Lost, The X-Files and The Walking Dead, but with the bite-sized presentation of a webseries. Get a free 8-page teaser of the book and help fund our Kickstarter here.